My husband is a smoker. We don't allow smoking in the house or in the cars, so he has to go outside. This is fine for him most of the year, but it gets very cold here in Ohio during the winter and very hot during the summer. He recently switched to blu PLUS+ e-Cigs, so now he can smoke in the car and in the house. There's more to take with you when you travel with a blu PLUS+ and tanks, so we made him a travel case from an eyeglass case. blu PLUS+ is a little different from other e cigs. Some e cigs have cotton inside that absorbs juice when you vape. You drop the juice on a wick, and then it gets vaporized. Unfortunately, when the cartridge is empty, up to 15 percent of the juice is still in the cotton. blu PLUS+ uses a tank, so there isn't a cotton filler. It has a cylinder with juice that gets vaporized, so you can use more of the juice. This also means that each puff is consistent, and there aren't any missing puffs. blu PLUS+ is available in many stores, but the full selection of tank flavors are at blucigs.com. My husband ordered the Xpress Kit bundle because it is such a great value. When you buy the blu PLUS+ for $14.99, you get a free pack of tanks valued at $14.99. He said it was really hard to choose an extra tank because they have so many flavors! He finally settled on vanilla to try first, and the Xpress Kit came with classic tobacco. They also have exclusive tank flavors online and different nicotine strengths in their online store that can't be found in stores. If you like saving money—who doesn't, right?—the blu Nation Rewards lets you earn points when you buy blu, connect your social media accounts, or read articles. You can redeem these points for free stuff or coupons. The one drawback of using an e-cig is that there aren't many cases. Instead of grabbing just a pack of cigarettes and a lighter and going on your way, you need to take the e-cig, tanks, and the charger. 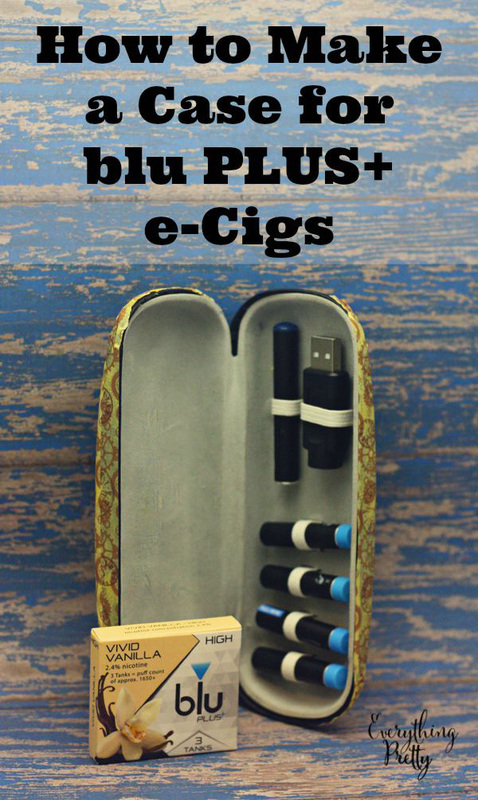 Eyeglass cases are inexpensive, easy to find, and convenient to carry, so we decided to use one to make an e-cig case. And by “we” I mean “he”. My husband came up with the design himself, so he made it while I took photos. We had an eyeglass case with a liner inside, so he carefully removed the liner. The liner was glued in, so he just lifted one edge and worked the liner away from the case. Then, he measured and marked where to put the e-cig, charger, and tanks. He wanted to be able to weave the elastic through the case, so he lined up the tanks on one side and the e-cig and the charger on the other side. You can lay yours out different if you want or if you use a different kind of case, but this is how he laid out his case. Use a craft knife to cut small slits in the liner where you want the elastic. He laid the liner on top of a self-healing mat so he wouldn’t cut the table. He had to make a cut on each side to get a clean line. Then he started on one end and weaved the elastic up and then back down to create a loop for each component. Repeat this process for the USB charger, the e-cig, and tanks. When you’re done, turn it upside down and carefully hot glue the edges of the elastic to the case. Lastly, carefully glue the insert back in the case. We used regular hot glue, but low-temp hot glue would have been better. I used washi tape to decorate the outside of the case, but you can leave it as is or add stickers to decorate it. I sealed it to protect the washi tape so it wouldn’t peel off. Now his blu PLUS+, charger, and extra tanks are ready to go with him, and they won’t get lost at home or on the go.